When many potential homebuyers decided to sit on the sidelines last year, home sales stumbled in many metro Phoenix neighborhoods. Despite a 14 percent drop in sales, the Valley's overall median sales price still climbed more than 5 percent to reach $207,000 for the year. Some neighborhoods in the Phoenix area saw double-digit price increases, and no areas saw dramatic drops in values. Mike Orr, director of the Center for Real Estate Theory and Practice at Arizona State University's W. P. Carey School of Business, said that after a few years of rapid price increases and rising sales, it was a good thing for the Valley's housing market to have a steadier year in 2014. "Though stable seems boring, it's not a bad thing for a housing market to stabilize for a bit," he said. And last year's slowdown is over. Now, a rising number of young first-time buyers along with the people who lost houses during the crash, called "boomerang buyers," empty nesters and investors are seriously looking or purchasing houses in the Valley. The area's home sales are surging in the first months of 2015. 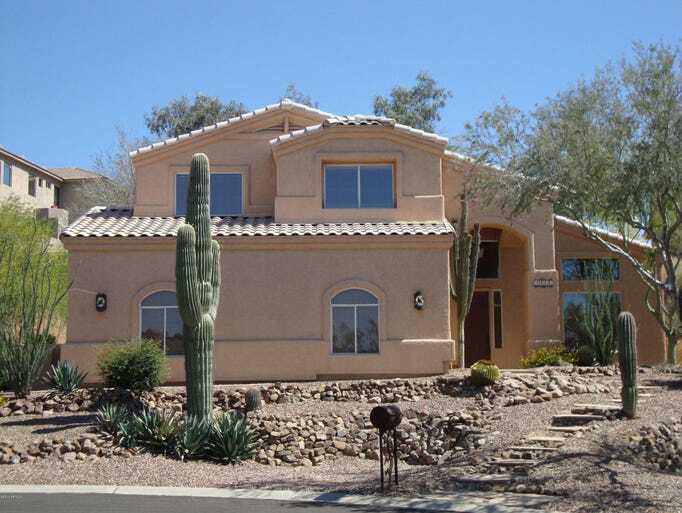 • Home prices climbed by 9 percent or more in 50 Phoenix-area ZIP codes in 2014. Several central Phoenix neighborhoods saw double-digit increases, signaling that more people want to live closer to job and entertainment hubs. • Home values have rebounded to pre-boom and crash levels in more than two-thirds of all metro Phoenix neighborhoods. This means more homeowners in most Valley ZIP codes, but particularly neighborhoods in central and north Phoenix, the southeast Valley, Scottsdale and Peoria can sell and either move up or downsize, which will help the area's shrinking supply of houses for sale. Prices in Tolleson and some other West Valley neighborhoods, hit hardest by the crash, haven't fully recovered yet but likely will this year. • Areas where home prices did dip in 2014, including a few neighborhoods in Chandler, Mesa and Gilbert, posted above-average increases in 2013. • Home sales climbed in almost half of the Valley's neighborhoods, especially areas with affordable home prices and others close to jobs, freeways and shopping. • While homebuilding overall fell across metro Phoenix in 2014, new-home sales jumped in north Peoria, south Chandler and near Phoenix-Mesa Gateway Airport. Hover over the image to see what gives the best return on investment. "Last year, we were all wondering where the buyers were," said Diane Brennan, a real-estate agent with Phoenix's Berkshire Hathaway Home Services and host of KTAR radio's "That Real Estate Show." "But parts of the Valley's housing market held up in 2014, and now buyer interest is up all over metro Phoenix's map." Many potential boomerang buyers were still waiting to qualify for a mortgage, and most Millennials seemed happy renting. Their moves will dictate whether home prices climb in the Valley this year. Here's a look at metro Phoenix's housing market in 2014. Some neighborhoods in Tempe, Chandler, Gilbert, Apache Junction and Queen Creek posted higher-than-average price increases during 2014. Now, demand from buyers is outpacing the number of houses for sale in some of the areas. Families continue to move to the southeast Valley to be near top-rated schools and to buy new, bigger houses. Brian and Victoria Della Valle bought a new house in the Mesa community Eastmark last spring to be near a school for their daughter. "We looked all over the Valley, but we wanted a new home and to be near a Basis school that didn't have a waiting list," said Brian Della Valle, who moved his family from New Jersey for his job. "We have a great neighborhood, shopping nearby and the 202 freeway makes it easy to get everywhere else." Eastmark is located in ZIP code 85212, where new home sales shot up 71 percent last year. Prices in the area climbed almost 14 percent, one of the biggest increases in the southeast Valley. Bill Olmstead of Keller Williams Realty East Valley has been sending out letters to homeowners in Tempe, Mesa and Gilbert asking them if they want to sell. He's trying to find houses for buyers he is working with who want to live in the areas but can't find what they want in the houses that are for sale. "There's a lot of pent-up demand now from buyers who want to be in the southeast Valley," he said. "But buyers are pickier now and want big yards and houses that have been updated." Metro Phoenix's priciest neighborhoods, from Carefree and north Scottsdale to Paradise Valley and Phoenix's Arcadia community, are located in the northeast Valley. Prices in many of the luxury enclaves climbed during 2014 as sales were flat or down for the year. Paradise Valley's median sales price was $1.27 million in 2014, down about 3 percent from the year before. But new-home sales and prices in the posh neighborhood, particularly on the site of the former Mountain Shadows Resort, are up. "Paradise Valley's luxury market for new construction is booming," Scott Grigg of Realty Executives said. The median sales price of new homes built in Paradise Valley climbed to $2.62 million last year, up 18 percent from 2013. Scottsdale's 85255 ZIP code, north of Loop 101 and east to the McDowell Mountains, is the most popular area in the northeast Valley for sales — almost 1,100 closed during 2014. That's more than double the pace of sales in Paradise Valley and some neighboring Scottsdale areas. The median sales price in 85255 climbed more than 6 percent last year. ZIP code 85255 also is home to an area rivaling Paradise Valley to become the region's most expensive neighborhood — Silverleaf in DC Ranch. Currently, a 30,000-square-foot mansion is on the market for $32 million in Silverleaf. That's the priciest house for sale in the Valley. The West Valley has evolved from an area known mainly for affordable houses to metro Phoenix's fastest-growing region, with the newest freeways, most popular new-home communities, retirement enclaves and growing job hubs. Many neighborhoods in the large area, spanning from Goodyear and Buckeye to the south through Glendale and Surprise north to Peoria, saw home prices increase last year. The winner for the biggest price jump in the West Valley was Surprise's ZIP code 85378. The area, next to Sun City West, saw a 13.3 percent increase in its median home price during 2014. More-affordable home prices still continue to draw buyers to the West Valley. People are buying newer houses that are mirror images of those in Scottsdale, north Phoenix or Chandler — but typically cost 25 to 50 percent less. Cassie Markoff bought a home in Peoria's 85383 ZIP code last year after looking all over metro Phoenix. She had rented in north-central Phoenix for several years but wanted a house closer to the open desert. "I don't think many people realize how nice the West Valley has become," she said. "I am glad because I was able to buy for less than I had expected." The median price in her neighborhood, near Pinnacle Peak Road and 91st Avenue, is $325,000, the highest in the West Valley. The area had 875 new home sales last year, more than any other Valley ZIP code. ZIP code 85383 also led the Valley for overall sales at 1,801 during 2014. Next was ZIP code 85338 in Goodyear, with 1,475 sales. Much of Phoenix is now considered infill because of the Valley's growth all around it over the past five decades. And the long exodus of homebuyers and builders from Phoenix to the suburbs during the 1990s and early 2000s is reversing. Home prices and sales jumped in central Phoenix neighborhoods last year as the housing market slowed in many areas farther out. The biggest increase in Valley home prices happened in central Phoenix ZIP code 85007, home to the F.Q. Story historic neighborhood. The area's median home price jumped almost 38 percent in 2014. The median home price in the north-central Phoenix ZIP code 85020 climbed almost 37 percent. A few other central Phoenix neighborhoods saw values climb more than 20 percent last year. As home prices climb and infill sites for new houses fill up, condominiums are growing in popularity. "There's incredible interest in central Phoenix," said Bobby Lieb of HomeSmart Elite. "I am seeing a lot of buyers in the area now who thought it was not cool a few years ago." 14 percent: Drop in sales in 2014 compared with 2013. 20 to 30 percent: Sales increase projected in next few months compared with the same period in 2014.